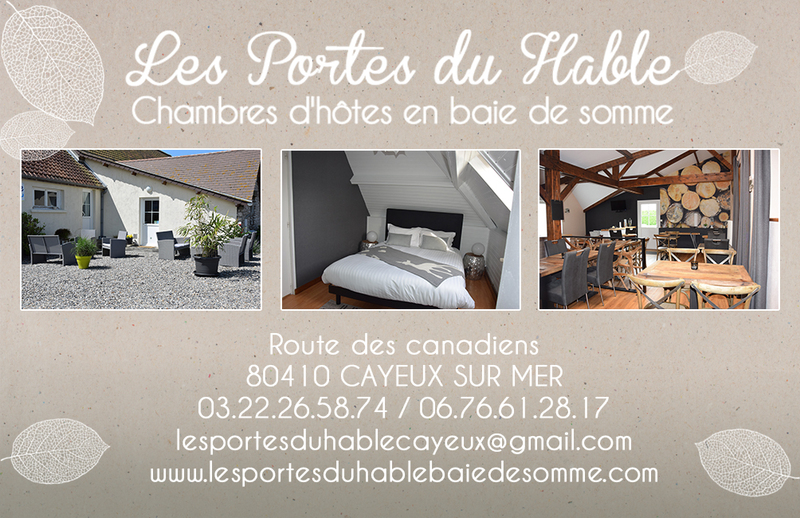 5 guest rooms, all with own shower room & WC, on property in the Hâble d'Ault, 1km from Cayeux-sur-Mer. 1st floor with separate entrance: room 1 (double bed), family room 2 with bedroom (double bed) & bedroom/lounge (bunk beds), family suite 3 with 2 bedrooms (queen-size bed) (twin beds), lounge, separate WC, family room 4 with bedroom (double bed) & lounge (single bed if required). Ground floor: room 5 (double bed) with lounge area. Guest breakfast room with lounge area. Direct access to the Hâble d'Ault. Play area for children. Pet allowed on request (7€/day). Tourist tax charged extra. Table d'hôte meals on request, Friday & Saturday evenings (NOT July/August). Cold meats/cheese platter (14€/person) & seafood platter (39€, 2 people minimum) possible Tuesday to Saturday only. Well-being gîte (2 people) at same address. Hot tub on owners' terrace.